After we published our Surface Pro review I went back and updated it to confirm that the SSD inside was indeed of the mSATA variety. My particular review sample used a Micron C400 mSATA SSD, similar to what I reviewed here a while back. Today, the patient folks at iFixit tore their Surface Pro apart and offered visual confirmation: the Surface Pro SSD is mSATA and technically, if you can get inside the system, it can be upgraded. While I applaud Microsoft for sticking with an industry standard SSD interface and not something proprietary, iFixit discovered that getting into Surface Pro isn't all that easy. While Surface RT was built from three discrete pieces of VaporMg (kickstand, frame and back panel), Surface Pro only has two (kickstand and the frame with integrated back). The downside to this simplification is that the only way into Surface Pro is to soften the adhesive that holds the display stack in place and pry it out. This tends to be a potentially destructive way of getting into a device, so if you're planning on buying a 64GB Surface Pro and upgrading to a larger SSD yourself you might want to keep this in mind. If you're still undeterred, it looks like you should be able to at least physically swap the Surface Pro SSD with something bigger. There's a whole other discussion about compatibility - I'm not sure what has been tested and validated with Surface Pro, but from a physical standpoint the SSD is upgradeable. 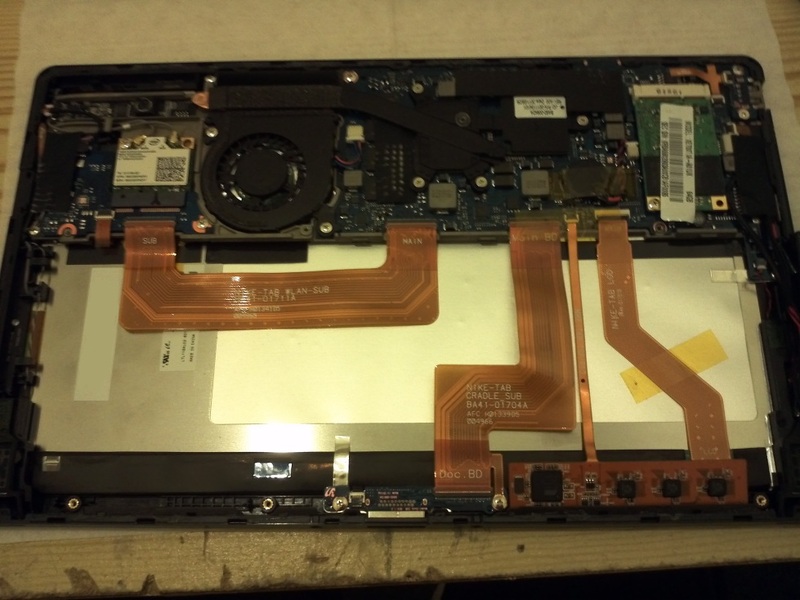 Compare the PCB of the Surface Pro with the PCB used in the MacBook Air or other Ultrabooks using similar hardware. The PCB in the Surface Pro is huge, has lots of unused space (more than 50%, just take a look at the back of the PCB). The parts on the Surface Pro PCB are nicely divided and spread across the whole area, but it rather looks like a prototyping platform than a finished product. The PCB could have been easily 1/3 of the current size (see other Ultrabook PCBs), allowing a slimmer casing or larger battery. 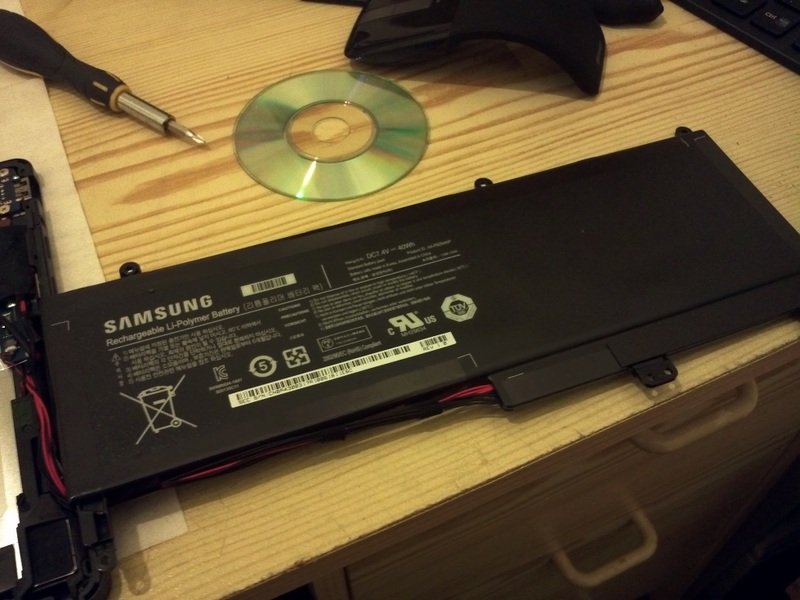 With a PCB in the size of the Macbook Air and the same casing they also should have had enough space to make the battery user replaceable, made the memory user replaceable and accessible from the bottom, together with the SSD. No use to be critical of an initial design. There are valid reasons for separating various areas logically. (1) First of his heat. Separating the various areas where lead to less long term failure. Most PCB failures occur after about 3 years of steady use. This is a device without a lot of cooling. Microsoft delivered the device, 2 years late, better than promised. They took a high level of risk and are looking for integration of the X-box, Cell Phone, Laptop, Desktop, and Tablet design all in one package. They are not going to get their over night. But this is a superior product to the RT and to the previous Zune. What exactly do you want to say? The next version will always be better. That's progress and happens everywhere. But you can only buy the device which gets sold now and not which gets sold in one year. In one year the other technologies have improved, too, so in one year you'll compare the next version with other newer devices and not with one year old ones. So don't dream how it might be superior in one year, because it will for sure, just as the competition. 1.) This is a device with a lot of cooling. I hope you can see the two active fans, two heat pipes and two cooper coolers? 3) Yes, but how is this related to the current product which definitely can't get upgraded with a higher capacity SSD without causing any damage to the tablet? 4) Ok? What's your point? If I buy the device now, I get Windows 8. I'm a tablet PC owner, and from Windows XP to Windows Vista a lot of things got improved in the tablet area. From Windows 7 to Windows 8, I barely see any improvements except Metro which does add nothing to the area in which the Surface Pro will get used (non Metro apps, usual programs (Adobe, Office)). With a service pack they won't add any new features. The time of Win 9 release is unknown. The Surface Pro is nothing new and not an 'initial design'. Windows x86 slates with pen input aren't anything new. See Motion Computing, Fujitsu Stylistic, Samsung Slate 7 and many others. They exist since Windows XP. Yes, Surface Pro it's superior to the RT regarding performance. Regarding portability, noise and price it's worse.